Just three years ago, on July 31, 2011, I began my crafthatchery blog to support my class work in an online course on blogging that I found at Media Bistro. At the time, my workplace (you know, the one that gives me paychecks) wanted me to start a blog for them, so taking the course gave me valuable instruction and insights about business blogging, as well. I found that I really enjoyed blogging, much more so at crafthatchery than for my paycheck-work. At work, I had to do a lot of research about a subject that just didn’t thrill me. Here, I get to explore making art, and maybe even give you some inspiration to pick up a pencil, a pen, or a brush. I can pull ideas and expertise from my head, and when I need to do research, I love the process. 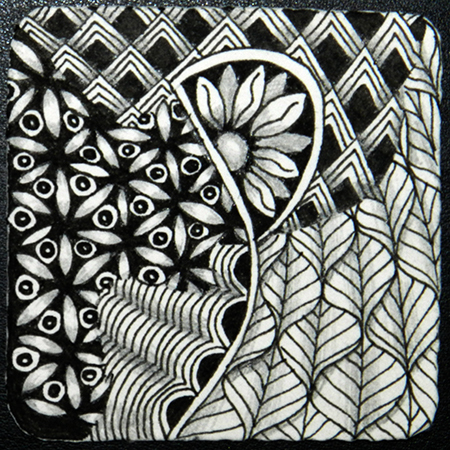 Just a month after that post, I was on a train, headed to Providence, Rhode Island, to become a Certified Zentangle Teacher. I look forward to a time when I’ll have more time to teach people this amazing practice. For now, I’m still at the paycheck-job, though I stepped back into a graphic design role from the writing I was doing. Definitely more up my alley. And so I come to my mind-space quandary. 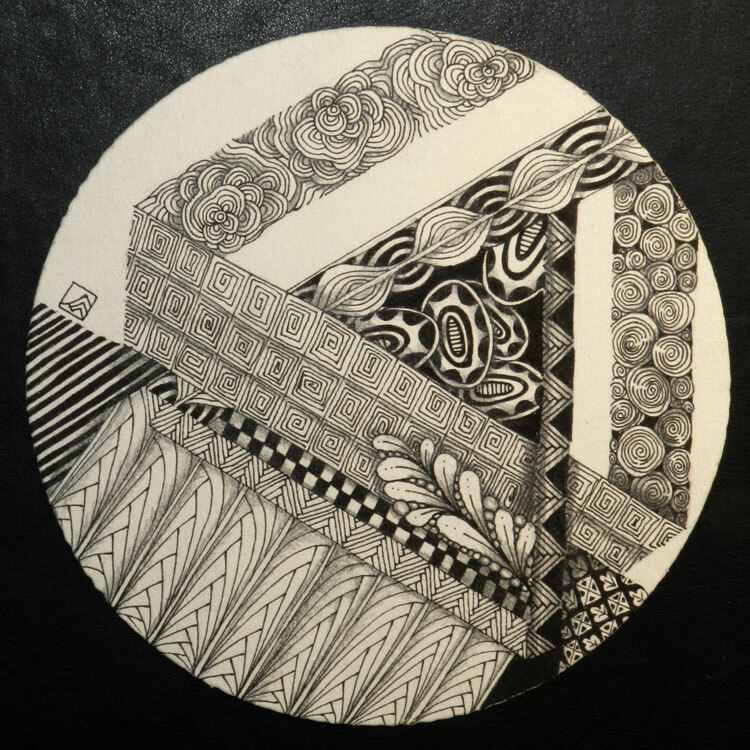 In all the time I’ve been writing posts and showing you my Zentangle work, I kept thinking that the name, crafthatchery, just wasn’t right. The little thoughts come to me something like this: If I had a sign on my door, announcing that there were unique drawing classes and inspiring products for sale inside, would the sign say crafthatchery? Doesn’t the idea of craft make people think more of knitting, or making carvings, or other more functional work? Shouldn’t there be “art” in the name since it’s a more artful result? Well, it’s been just wrong-feeling enough to make me think about another name. Something that I can have for a blog, and maybe a website, and a place with a sign on the door. My mother said, “But I like crafthatchery!” And really, so do I. I like how the two words, craft and hatchery, play together. I like the visual images that emerge as a result. But I’m a stubborn one, and so are those thoughts in my head. A new name it will be! And it has to be two words that play together nicely and create positive, creative images in peoples’ minds. After some thought, and playing with words and images, I’ve got a name that I think solves my problem. Without further ado, I invite you to join me at the art kettle. Same me, same art and meditation and hopefully inspiration… just a different place. crafthatchery will still exist, just without any new content. So come on over and see what’s brewing at the art kettle. Oh, and of course I can’t leave this space behind without a tile for you to see. This is a little Bijou tile. They’re exceptionally cute at two inches square. Tangles used: quandary, flukes, crescent moon, leaflet, and deelish. This week’s diva challenge is to use a tangle by Joyce Evans, who hails from Vancouver Island, BC, Canada. It’s a tangle that allows for some creative interpretation. 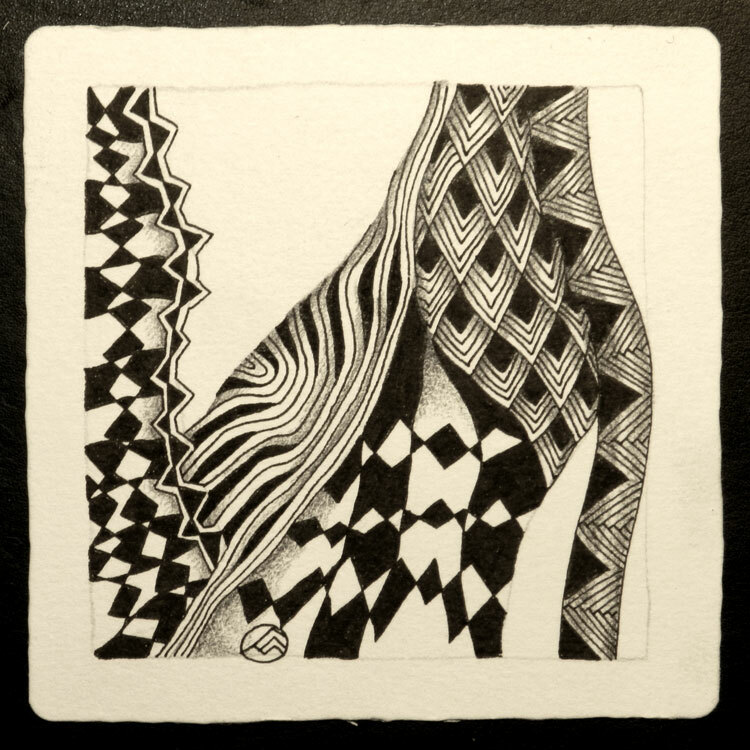 I like the basic shapes that comprise it, and lead quite effortlessly into other tangles. It was easy to add quandary, with the same leaf shapes, and quib flowed quite nicely out of the tops of the “stalks” created by the bugles. Tangles used: bugles, quandary, quib, lotus pods, and striping, plus some leafy shapes that started from a verdigogh type of plant form. 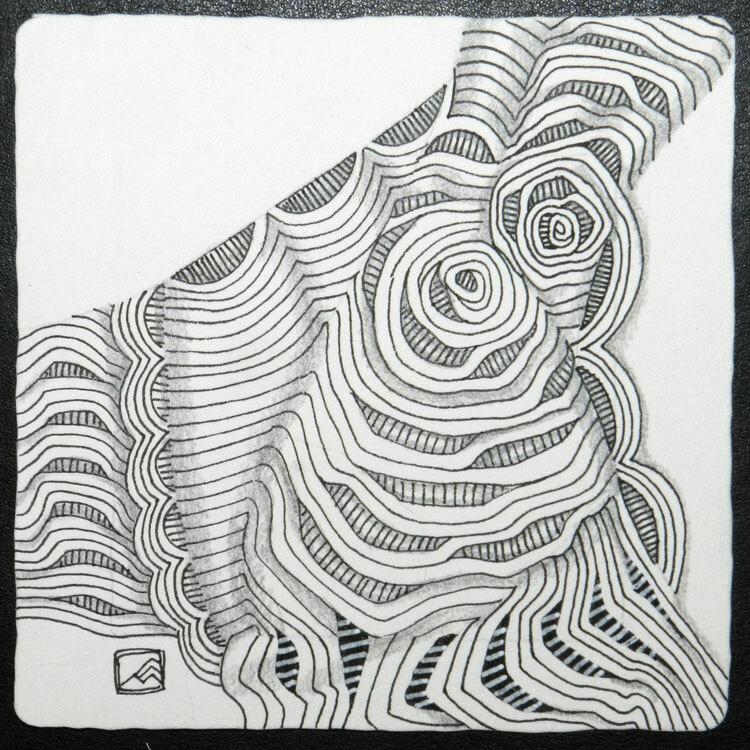 Tangling can look deceptively like doodling, but doodling it is not. Doodling is something you do with your hands while your thoughts are elsewhere, and can be very useful in some circumstances. In contrast, this art form is very focused. Your attention is on the pen, the paper, the flow of the ink, the patterns, the drawing; each stroke is drawn consciously and deliberately. 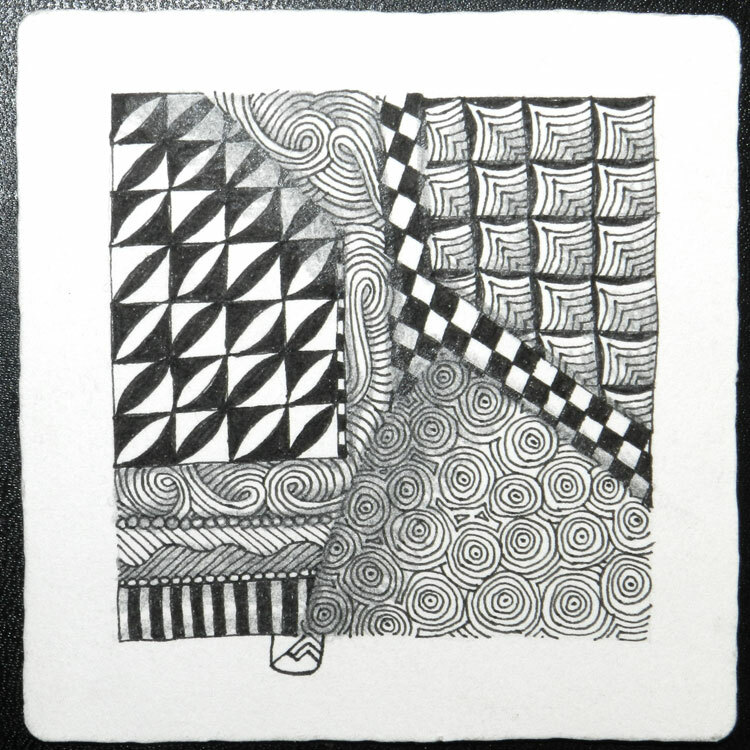 I am not a chronic doodler; preferring the focused mindset of tangling or drawing. Maybe that comes from a lifetime of drawing and painting practice, or maybe we all have an area that we gravitate toward on the doodle-to-drawing continuum. I sure do know when my mind wanders a bit while tangling, though! Lines wander, or cross where they weren’t intended to. 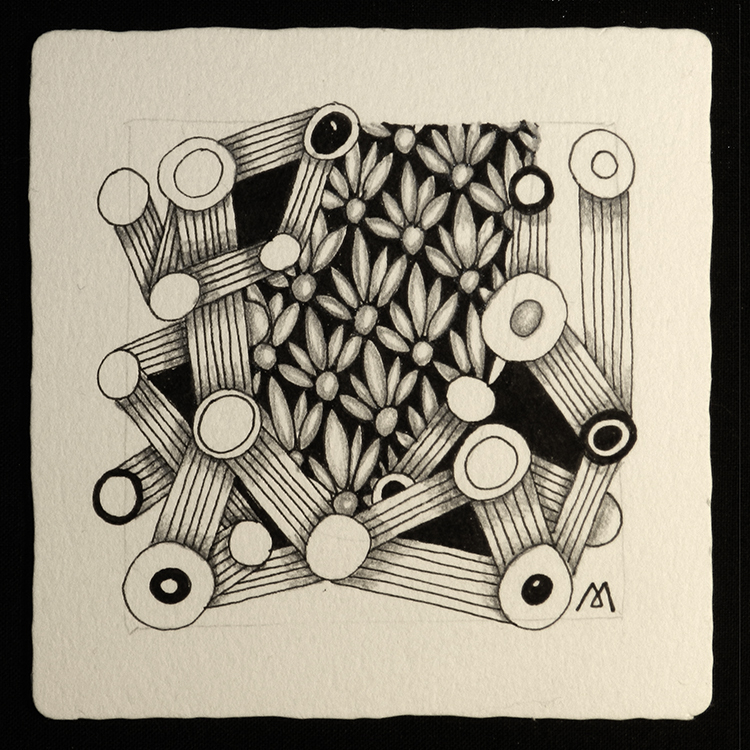 Tangles take on odd shapes. 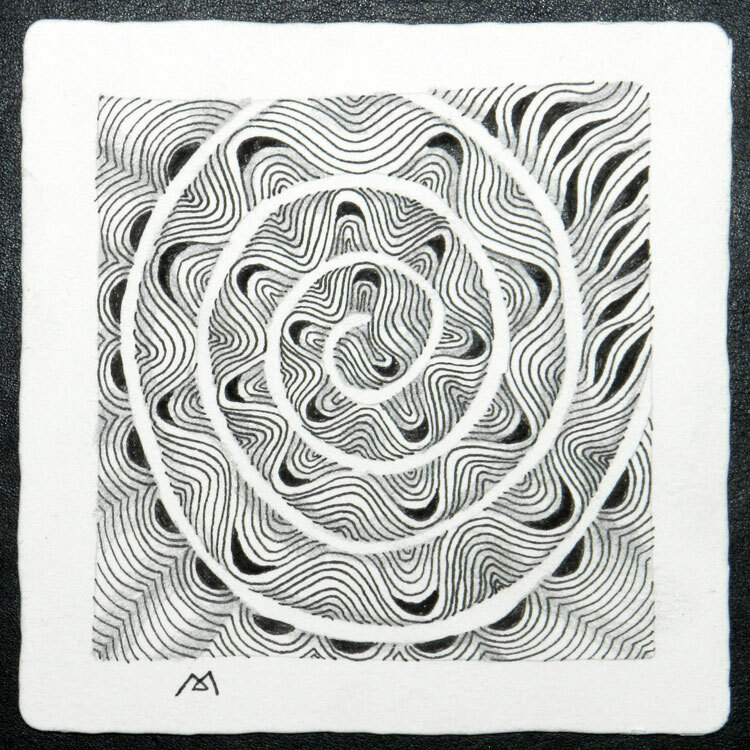 Like a breathing meditation, where you gently bring your mind back to the air flowing in and out of your body, with Zentangle, you gently swing back into focusing on your hand, the pen, and the stroke you are making right now. 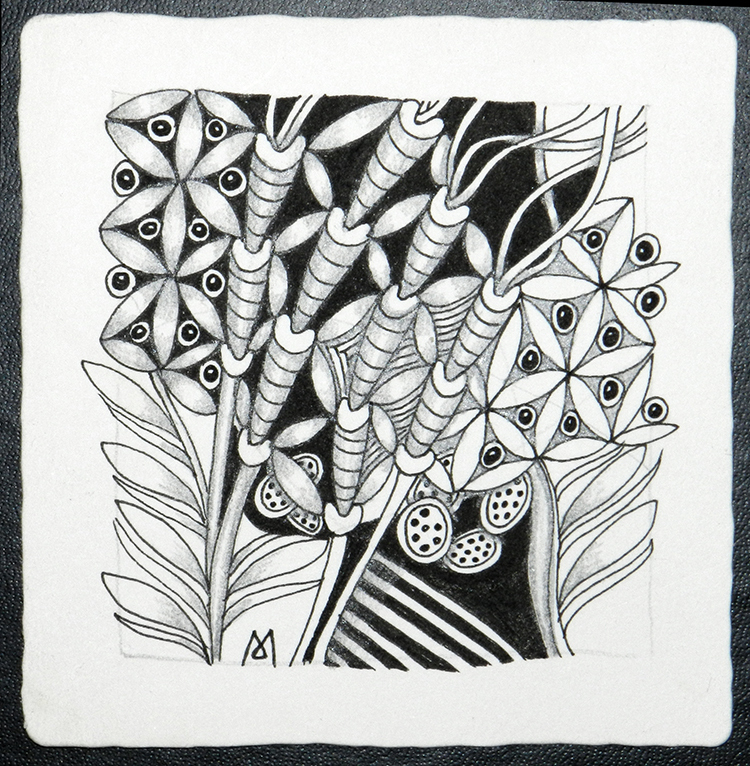 I did two tiles for the challenge, using what started as a doodle for Laura Harms, but grew into a tangle. She hasn’t named it yet, so in my head I am calling it divadoodle. With some color, and tripoli, and Daved Levitan’s bridgen, which is like a mini version of the diva’s new tangle. 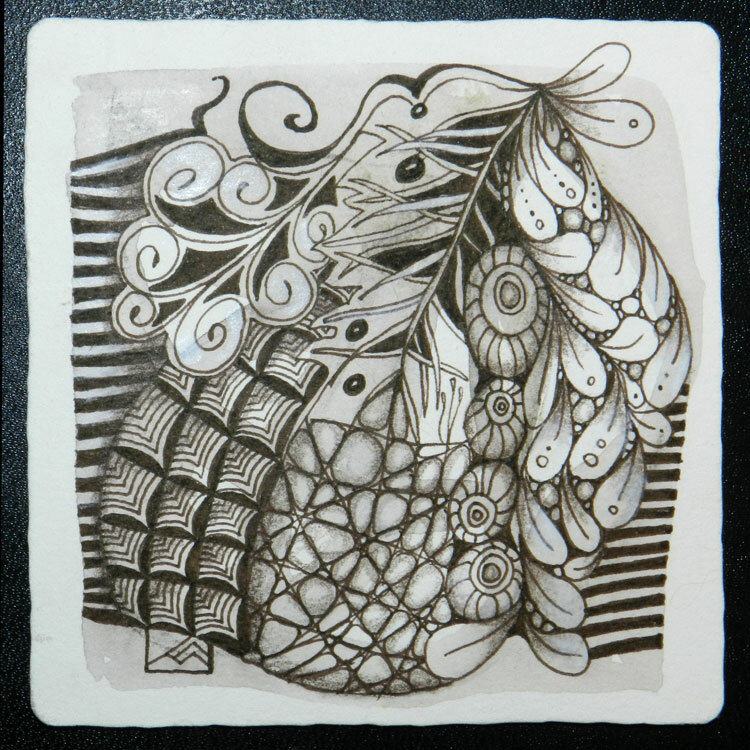 The latest tangle coming from Zentangle is called rixty. 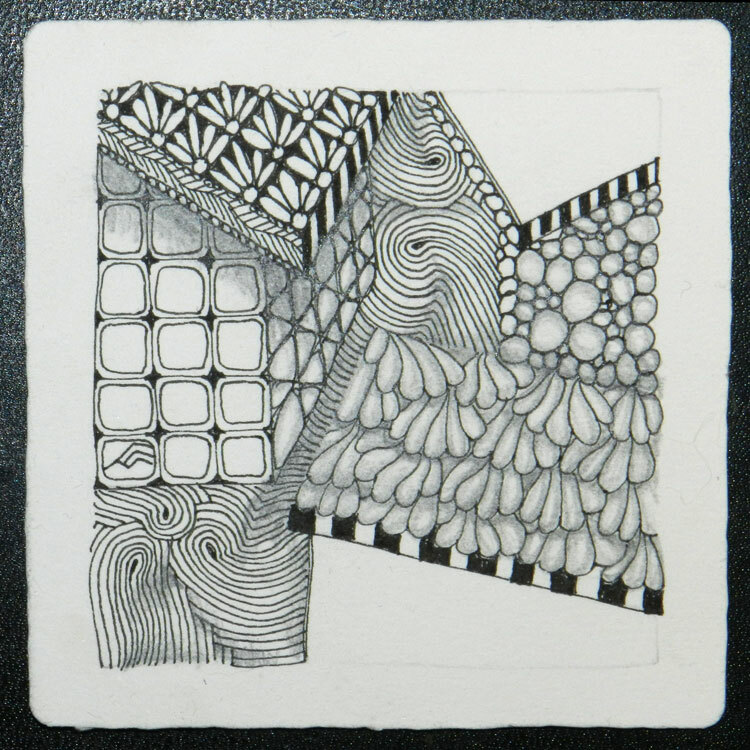 You can find out all about it and get the step-outs in the April 8 Zentangle newsletter. The diva challenge this week was to use rixty, so I did a couple of tiles. Very fun to wander with this tangle! In addition to rixty, I used hollibaugh, quandary, shattuck, paisley boa, and opus. The second tile includes rixty, sláinte, tripoli, meer, hibred, and knase. 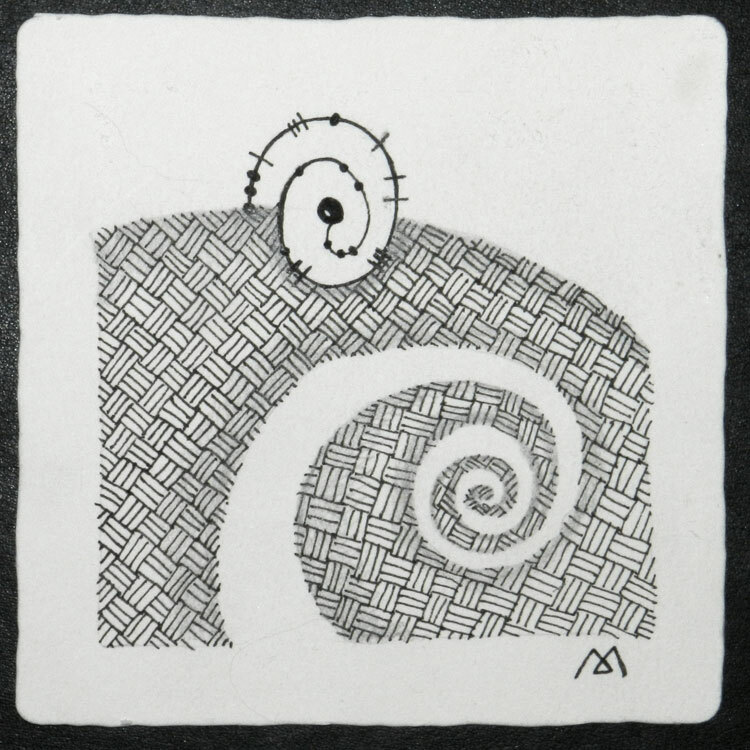 This week’s diva challenge was to use a spiral as the string. 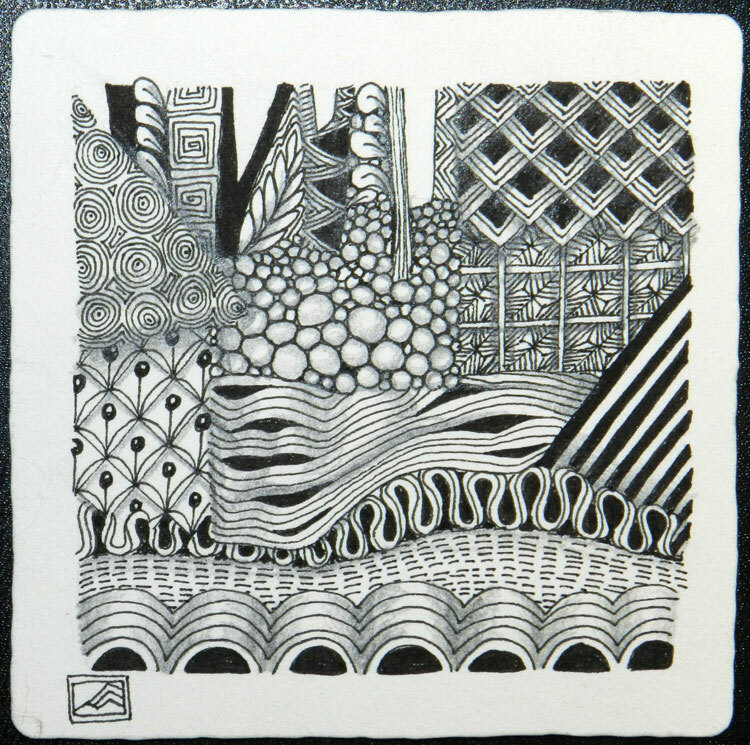 For those unfamiliar with Zentangle®, the string is a light pencil line drawn first, which forms the framework for the tangles (patterns) that are drawn in ink on top of the string. I found the spiral form really conducive to using fewer tangles than usual. Tangles I used: a knase-hibred tangellation, flux, rain, and beadlines. Wud, crescent moon, and divadance. 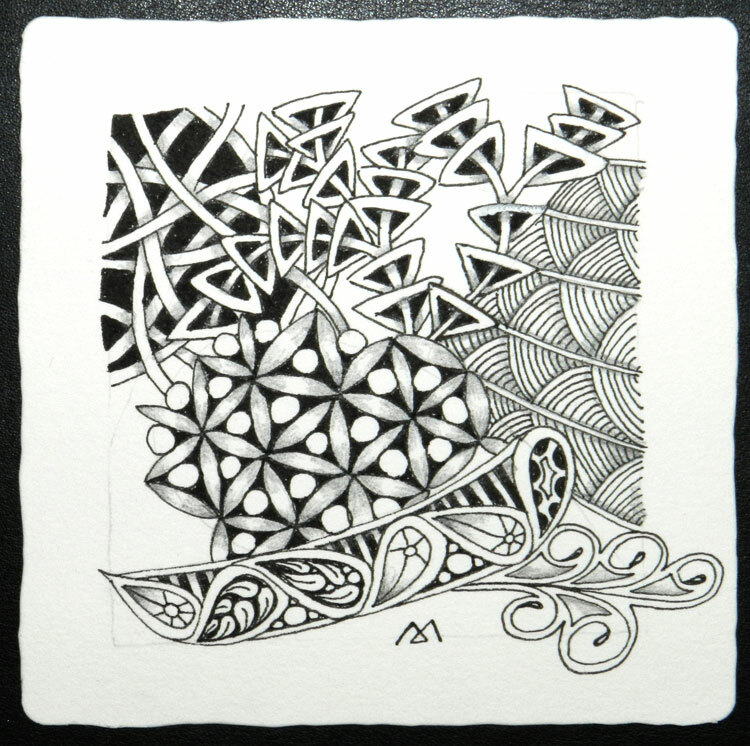 One thing that recurs in any art practice, and in my regular Zentangle® practice, is the idea of exercise. It builds skill, just like an exercise program for your body builds muscles and endurance. It’s also about welcoming the “what if?” question, repeatedly conjuring up new explorations. Artists everywhere often conduct their explorations within constraints, like using only black and white, or straight lines, or a certain canvas shape… and the results, in turn, lead to new exercises and explorations. 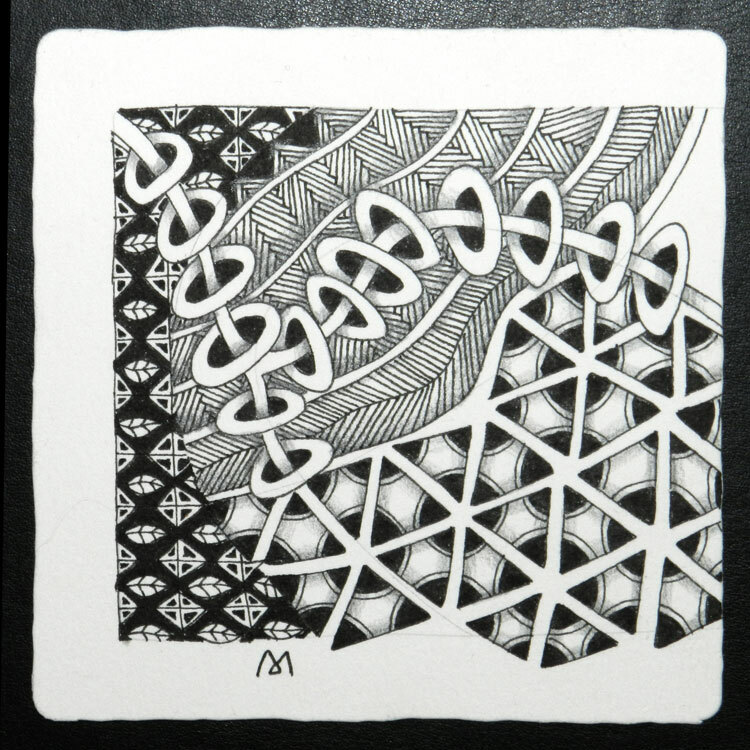 For anyone who has learned the Zentangle art form (and for anyone ready to jump in), there’s a new exercise waiting for you every Monday morning at iamthedivaczt, a blog hosted by Laura Harms, who hails from Saskatoon, Saskatchewan in Canada. If you have time, do more than one! You’ll find yourself asking more what-ifs and inviting yourself to more exercise. The results are amazing, and limitless. This week, the challenge was to create a duotangle using only the divadance and crescent moon tangles, two official Zentangle patterns. You can see where I got to with them, below. 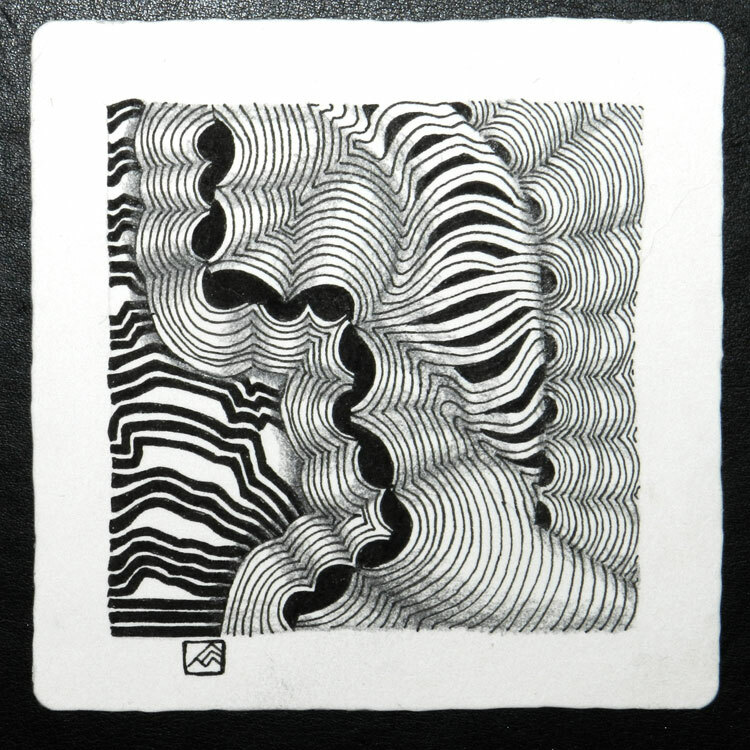 Above, I explored drawing divadance by filling in the spaces between the lines (on the left side). 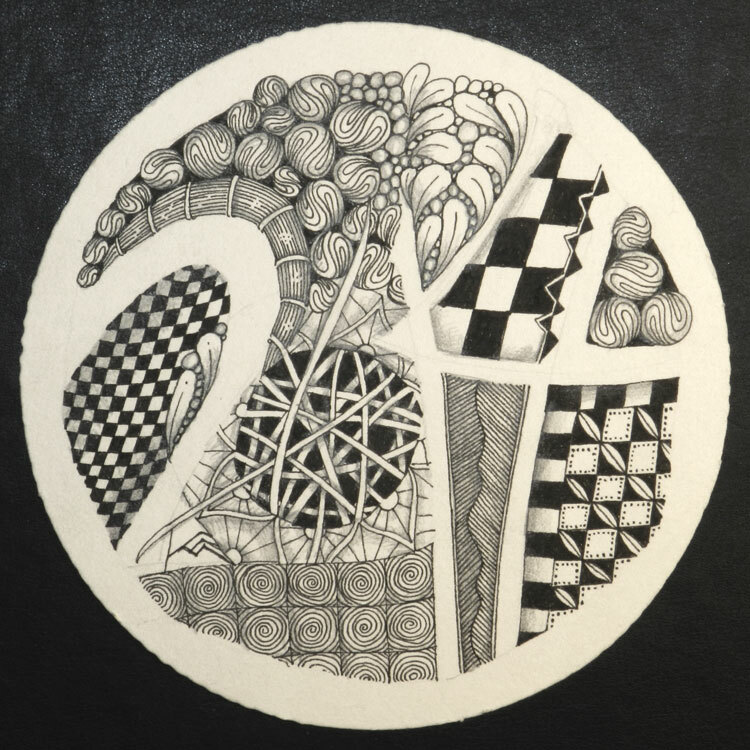 I looked at what Simone Bischoff did for the challenge, and really liked how she used circles instead of half-circles for the crescent moon tangle. So, I tried it myself (upper right). I decided not to use solid black areas in the tangles, and stuck with repeating lines. A UMT (use my tangle) by Erin Olson this week on the diva’s blog inspired me with its story, and with its angular form. There’s also a striking contrast between solid black and white areas. Here’s my tile, using charlie, along with rain, divadance, flukes, and a combination of knase and hibred. I had the pleasure of attending a living room show last week, in Madison, Wisconsin. My daughter was the star performer, kicking off her Kickstarter crowd-sourcing project. You can see a video and read all about the project (and donate, if you like) here. The hosts introduced us to the house they call Muriel, and a fun idea: living room shows. I drew a tangle in honor of Muriel. She’s 99 years old. Tangles used: all about v, juke, mi2, shattuck, knightsbridge, quandary, and flux. This week’s diva challenge invites us to tangle on an outline of the Moebius Syndrome Foundation logo. The syndrome is dear to the hearts of many tanglers now, because diva Laura Harms shares her experiences with Artoo, her son who has the disorder. 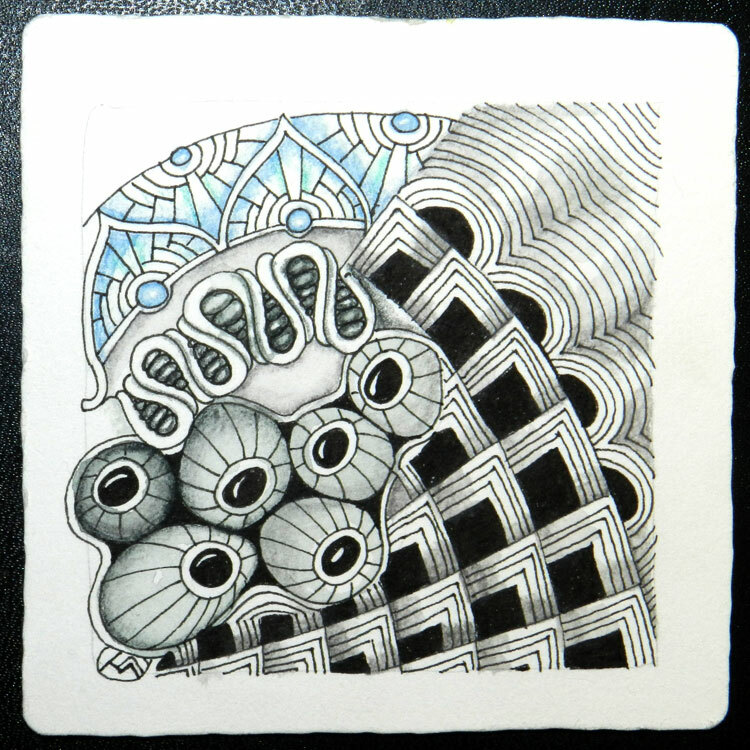 We did this challenge last year (here’s my tile), and I really liked the Zentangle I came up with. That made the second time around a little daunting! I decided to try a Zendala tile this time, and abstract the moebius strip a little more than last year by not including all of it on the tile. Tangles used: striping, betweed, hibred, knightsbridge, flux, sláinte, emingle, printemps, knase, and unyun, plus an African-inspired symbol and a technique I saw used with beautiful results by a man named Witold Reidel. You can see his delicious drawings here. 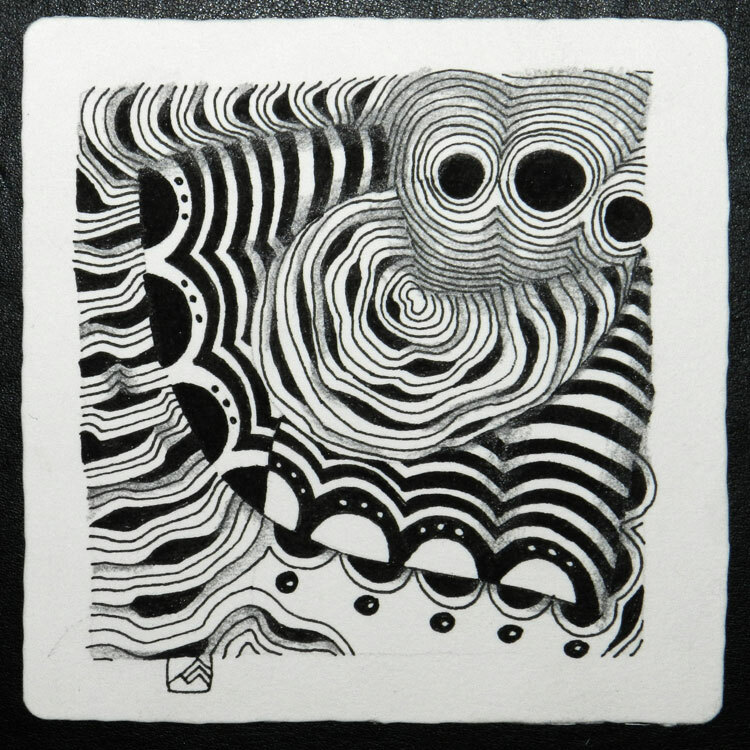 Click on catalogue for a clickable list of his drawings. 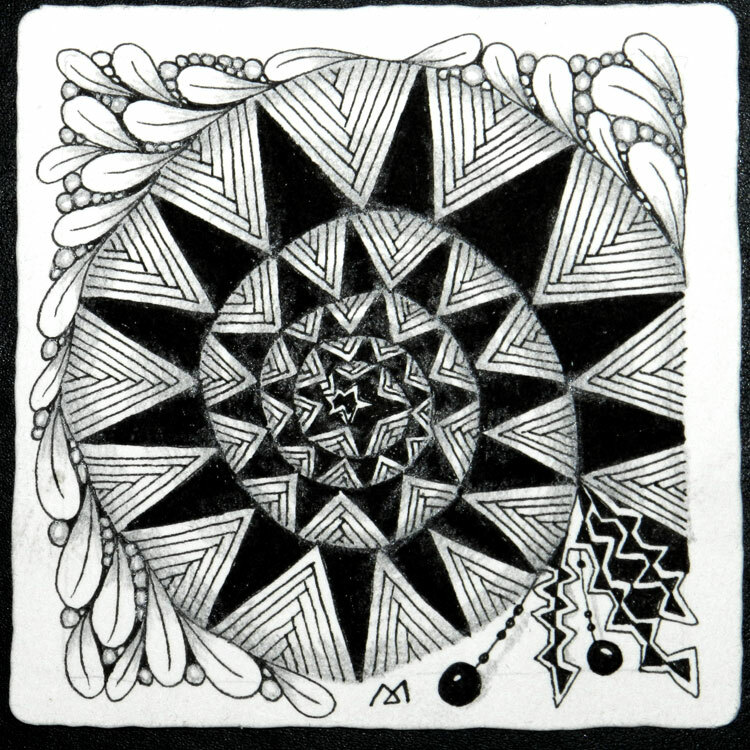 This week the diva challenge is to create a zentangle with the new year, or 2014 in mind. I decided to create a zendala for the first challenge of the year. I used these tangles: tortuca, cruffle, tipple, zander, knightsbridge, flux, hollibaugh, meer, rain, copada, and a Polynesian barkcloth pattern. 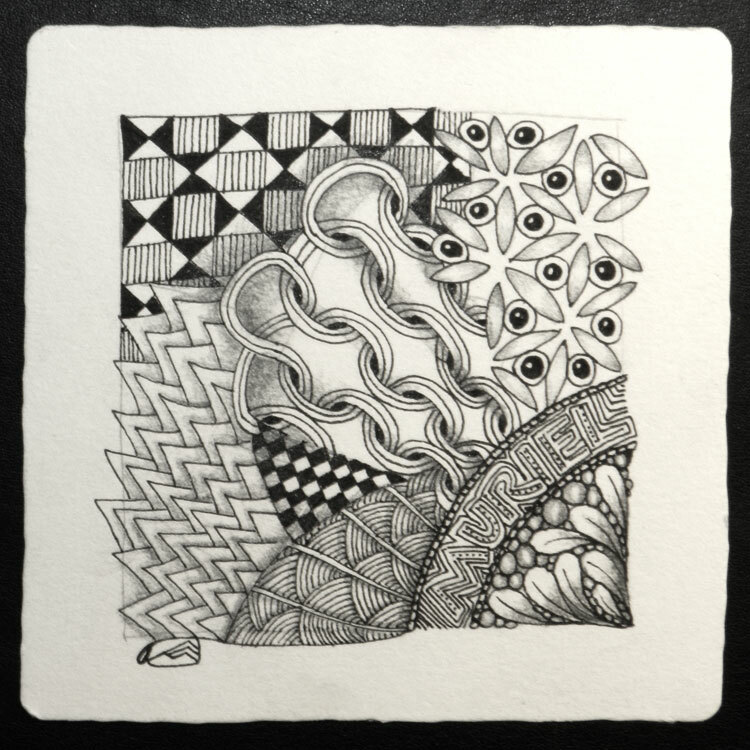 As the old year closed and the new one circled around with more daylight (and a lot more snow here in Wisconsin), I decided to broaden my Zentangle experience. 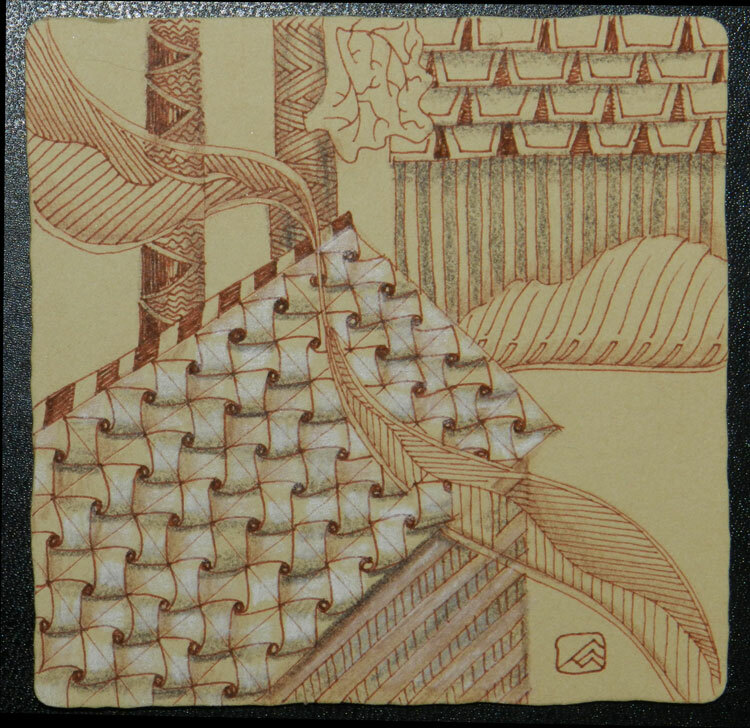 In addition to my usual black ink and graphite on white tiles, I tried brown inks and colored pencils — and the new Zenstone — on the new brown Renaissance tiles. I also experimented with water soluble graphite and colored pencils on regular white tiles. And then, just to mix it up a little, I went back to the old, familiar white tiles with black ink. Tangles: flux, tipple, tripoli, a hollibaugh variation, sez, lanie, and eye-wa. 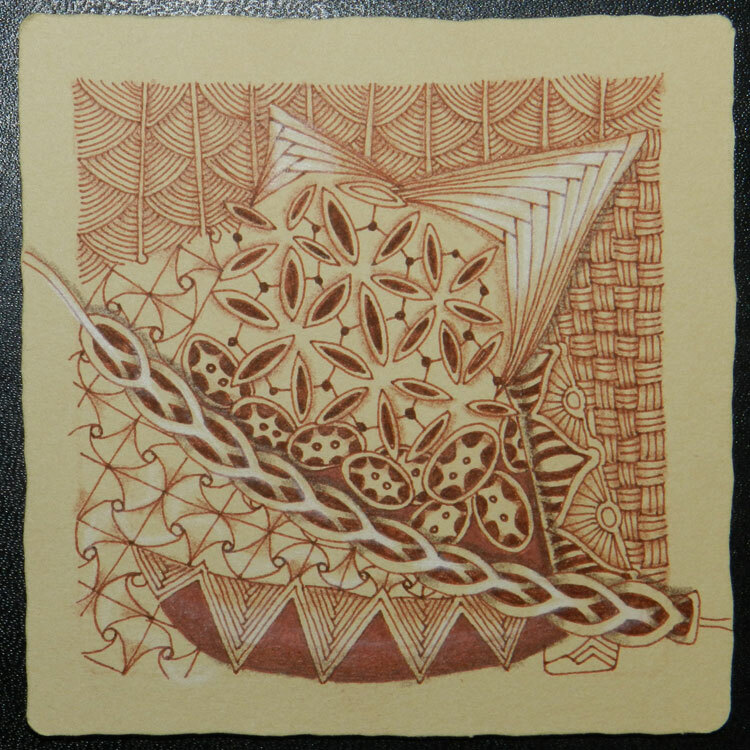 First, I used a really dark brown pen on a Renaissance tile. I also used some Prismacolor pencils, and, in the flux tangle along the top, I highlighted the leaves with my new Zenstone, which I love. It adds a light tone (not quite as white as the white Prismacolor pencil which outlines the tripoli triangles, below the flux), and it is remarkably strong. When I hold it, I am aware of its squareness, and it looks translucent, not like it can produce such a nice light effect. Tangles: copada, crescent moon, borbz, prestwood, and flukes. Next, I experimented with colored pencil (the blue and green in the copada) and with water-soluble graphite (Derwent Graphitint) that has just a touch of hue for all the other shading. Tangles: shattuck, betweed, quandary, well, elven, knase, copada, keeko, and an oval pattern I’ve been working on. 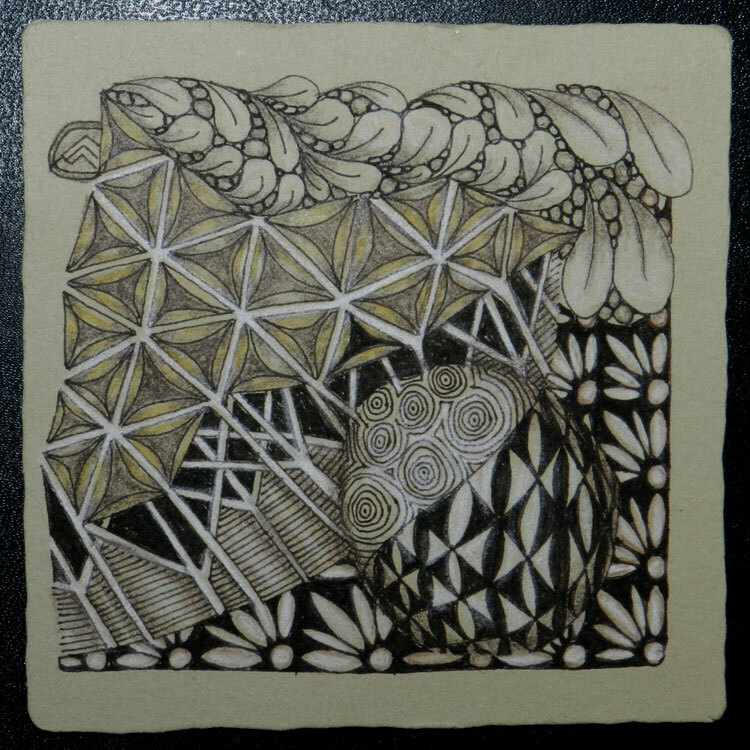 On another Renaissance tile, I used the Sakura Pigma Micron lighter brown ink (more of a sienna than their super dark brown, though when I filled in larger areas the ink really got dark). Then the Zenstone and some Prismacolor pencils. Aside from the ink, I haven’t tried any water-based media on these tiles. They are a little more fragile feeling than the white tiles, and felt like they wouldn’t take water well. They really soaked up the ink to the point of getting really dark. Tangles: opus, striping, krli-qs, warble, nzeppel, borbz, verdigogh, and flux. 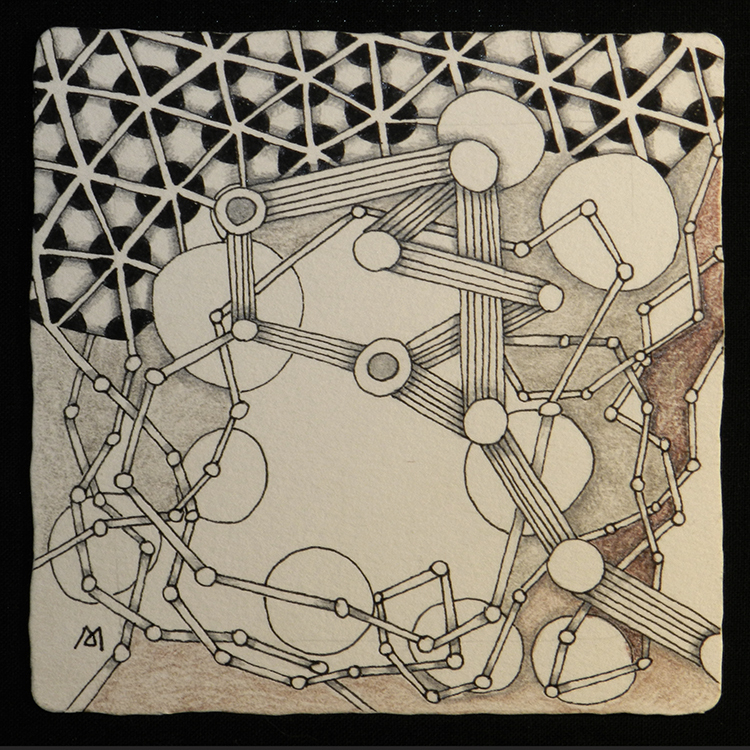 For this tile, I used a water-soluble graphite wash as my string, and tangled on top of it with the dark brown ink. It is really close to black. Then I went in with dark brown and white pencils to add shading and highlights. Tangles: a variation of well, knase, hibred, meer, shing, striping, festune, and a leafy form like sampson. Inspired by Margaret Bremner’s houses, I wanted to try some house-like structures, only with a little more abstract quality. Where hers are whimsical and delightful to look at, I wanted mine to be about surface planes. I live on a hill and look down at rooftops. I like how they blend together with the landscape. This tile was still a bit too realistic for me. Tangles: a variation of florz, dansk, meer, lanie, sanibelle, tipple, nzeppel, and striping. I returned to the old black-and-white to work on a string made of the forms that suggest the planes of walls and roofs. More abstract; more me. Tangles: flux, emingle, ynix, knase, tipple, flukes, sez, striping, prestwood, dribbetz, divadance, crescent moon, a variation of chillon, and a variation of bucky. I added a few more organic elements to the planes and like the results. Tangles: eye-wa, sand swirls, knightsbridge, warble, sez, and meer. This one got a lot more flat, and doesn’t suggest landscape as much. It’s more about filling large areas with pattern. Sometimes a change, or trying something new, doesn’t have to be a big, huge shift. Just a different background, or a dollop of color are all it takes to keep things lively and fresh.